Greece is not prepared for the refugee crisis, reports Natasha Tsangarides. Hamza is a 9-year-old boy from Hama, in west Syria. He was hit by a bomb a few weeks ago, and has injuries to his leg, hand and head. He cannot now talk or walk. Like more than 4 million other Syrians, Hamza and his family escaped from the war that has destroyed their country. They travelled through Lebanon and Turkey and, then on a small boat with many people, went across the Aegean Sea to Europe. 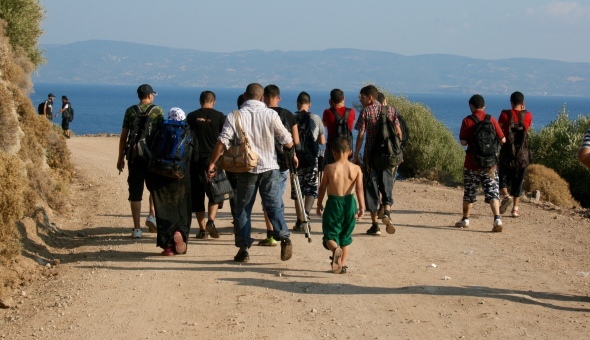 When Hamza got to Lesvos, he and his family had to walk about 15 kilometres on mountain roads to the bus stop. The bus would take them to Mytilene, the island’s biggest city, where refugees have to register. But there are not enough buses, so most people have to walk another 60 kilometres. At Mytilene, there were thousands of people waiting to be registered. There was only one photographer to register everyone, so they have to wait a long time - many people have to come back the next day. Hamza is now waiting at the refugee camp, 3 kilometres away from Mytilene. He needs medical treatment but it is night and there are no doctors at the camp. There are also no tents, no blankets and no food. In summer, with the calm Mediterranean sea, more than 2,000 refugees arrive every day in Lesvos. On busy days, 4,000 refugees arrive. Skala Sikaminias, in the north, is usually quiet, but now there are many old rubber dinghies (boats) and lifejackets. Every day, the boats come in. And every day, there are no officials or NGO representatives on the beaches. When refugees reach Mytilene, 75 kilometres away, officials meet them there. When the refugees arrive, they cry, laugh, sing, take selfies and pray. But soon they realize all the problems they face and they become sad, disappointed and afraid. Lesvos has become hell: very hot and dirty. Refugees wait for a long time to be registered so they can leave the island and continue their journey. So many refugees are now arriving, there are not enough ferries to take them to Athens, so they stay on Lesvos longer and the island becomes more chaotic. There are now about 17,000 refugees on the island and the UNHCR has called for an emergency evacuation. Each morning at 5.30, British citizens Eric and Philippa Kempson go to the coast and welcome the refugees. The Kempsons and their small team of volunteers give them water for the journey. Volunteers drive women with babies and people with disabilities to the bus station, in a car park in Molyvos. At the bus station, volunteers give water and sandwiches to the people who arrive. Most people then walk to the city, but some wait in the car park - with no toilets - for a bus – with no timetable. Recently local associations have put made them close the transit centre (run by volunteers). And refugees are not allowed to wait in the car park. Also, the authorities have stopped taking people by bus to the city because there are too many people. So people have to sleep in the open, or everybody, young and old, walks to the city. The city of Mytilene is one of the most beautiful in Greece, with old buildings and hills. Now there are so many refugees in the port and parks of the city and tents everywhere. Some are waiting to be registered. 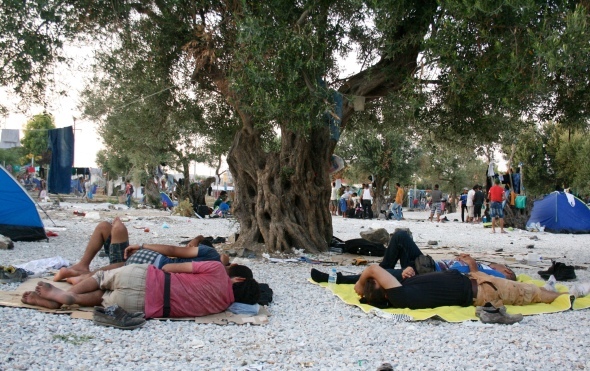 Others prefer to sleep in the open – the camps are too dirty. Eleni Kelmali is a junior Lieutenant of the Lesvos Hellenic Coastguard. They go on search-and-rescue missions and they now help the police with registration and crowd management at the port. Hundreds of refugees wait in the hot sun every day as the authorities try to keep refugees calm and form queues with no interpreters. ‘This is not the Europe I expected,’ a Syrian man told me. The refugees who arrive will not always find food, water and shelter. Greece has too many refugees and has it’s own economic crisis, so it cannot cope’. The city is dirty. The two refugee camps, Kara Tepe and Moria, are worse. The Mayor of Lesvos set up Kara Tepe camp on a traffic education site. It was built for 500 refugees; but now there are about 2,000 people there. The camp was originally only for Syrians, but several other nationalities also live there now because it is difficult to control. The International Rescue Committee (IRC) is one of the only NGOs working in Greece for the first time to help in the refugee crisis. 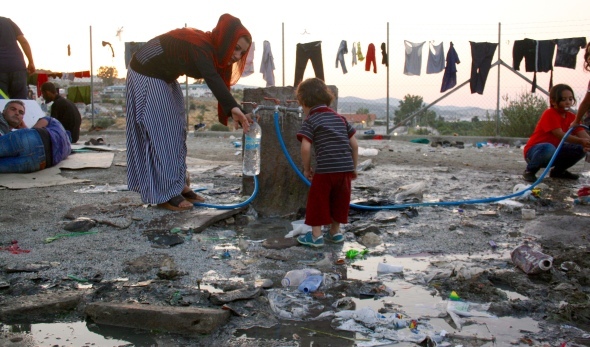 The NGO provides information, water and sanitation services in Kara Tepe camp. They are planning to do more inland too. There is no camp management of the camp, it’s dirty and full of rubbish – but it is much worse in Moria. When you walk into Moria camp, it is hard to believe it’s in Europe. It is a detention centre with space for 700 people and it is full. The area outside it is full of tents for about 3,000 refugees. It feels desperate. The few people who speak English ask the same questions: ‘Why is there no water?’, ‘How can I wash here?’, ‘Please, where is the doctor?’ and ‘Do people know we are here?’. There is a faster system in Greece for Syrians. So their registration papers are usually ready in a couple of days. Other nationalities often have to wait 20 to 40 days. They get food, but it is never enough. No-one was prepared for so many people. There is water from the tap, but it smells, so many people buy water from the kiosk. The lucky people have tents from international organizations eg. Médecins Sans Frontières; most sleep on cardboard boxes or mats. With no management or authority at Moria, people do not feel safe. There are often fights and some people have knives. Amin is a 13-year-old from Afghanistan. On 20 August, we saw about 100 people fighting. Some of them had knives, and one man was stabbed. No security staff or doctor came. ‘Where is [the] UNHCR? Where are the guards? There are fights here. Who will protect us? It is not safe at all here. You can’t sleep at night,’ he says. Antonios Gkagkarellis, a police lieutenant at Moria camp, says there are 8 or 9 police officers every day at Moria. But they only guard the interior detention centre. ‘We don’t have enough resources. Inside, we have about 750 people and outside about 2,500. This isn’t safe. Our lives are not even safe here. There are so many people outside that we can’t check for knives. With this situation, we can’t cope,’ says Eliza Goroya, Amnesty International’s Campaigner for Greece. On the island of Lesvos, it is very clear that Europe is not protecting the refugees. People feel angry at EU leaders and the UNHCR. This is the biggest refugee crisis since the Second World War, but the UNHCR has not yet given even one tent. This year, the organization has given out 7,400 bottles of water - the same as the volunteer Kempsons give out in two days. Something is very wrong. The smugglers are more organized than European states; and kind, untrained volunteers are helping more people than international humanitarian agencies. The EU has not yet taken responsibility for the refugee crisis. As the situation gets worse and there are more refugees on the island, the EU urgently needs to increase emergency support to people who help refugees arriving in Greece. On 14 September 2015, there is a meeting in Brussels of EU interior and justice ministers. This is an opportunity to make the European asylum system work and to create safe and humane routes for refugees - respecting their rights and protecting them. NOW READ THE ORIGINAL: http://newint.org/features/web-exclusive/2015/09/07/refugee-crisis-greece-lesvos/ (This article has been simplified so the words, text structure and quotes may have been changed). This page was last edited on 8 September 2015, at 18:43.